YOU DID IT. I am very happy to report that the proposal to fund a network of protected bike lanes in downtown Silver Spring was supported unanimously at committee today, as well as planning funds for the Bowie Mill Bikeway in Olney. Thank you Roger Berliner, Tom Hucker, and Nancy Floreen for supporting transportation options for everyone and Washington Area Bicyclist Association (WABA) for going to bat for us. I know my council office was happily buried in eloquent supportive messages from residents of Silver Spring, Bethesda, Rockville, Olney, Takoma Park, Burtonsville, even Boyds! Let’s make this a sign of what is to come for communities all across our great county. Biking does not have to just be for those brave enough to ride in traffic lanes, it can be an option for everyone if we build the right protective infrastructure. Lots to be happy about today. We will need to continue working to keep those funds in the capital budget as we head to a final budget vote in May, but so far so good. Thanks to Nancy Navarro and George Leventhal as well on the Bowie Mill Bikeway planning funds, in addition to the state electeds who supported it, Eric Luedtke, Anne Kaiser, and Craig Zucker. The project was first requested by the Greater Olney Civic Assocation. Following please see my Dear Colleague Memo regarding a protected bike lane network in Downtown Silver Spring. As you prepare for your discussion on CIP transportation projects on Thursday, March 3, I would like to respectfully request that you support adding $1.5 million per year to the CIP for the Bicycle Pedestrian Priority Area (BiPPA), in order to continue the project’s county-wide planning while adding funding to create a full protected bike lane network in downtown Silver Spring. The BiPPA program (CIP #501532) supports the planning, design, and construction of bicycle and pedestrian improvements in the County’s thirty BiPPA areas with immediate focus in the Silver Spring CBD, Grosvenor, Glenmont, Wheaton CBD, and Randolph/Veirs Mill. The FY16 Council-approved budget for this program is $1 million per year, with $150,000 and $850,000 for planning and construction, respectively. The County Executive has recommended $1 million level funding over the FY17-22 CIP horizon. The FY16 funds are programmed for the Spring St. protected bike lanes and the first phase of the Silver Spring bike parking program. In recent months I have worked closely with MNCPPC and DOT, with support from Councilmember Roger Berliner, to model a more robust protected bike lane network for Silver Spring, as well as White Flint. The latest bicycle research shows that people are more likely to bicycle in lower-stress environments that provide protection from motor vehicles and separation from pedestrians. Facilities like separated bike lanes and protected intersections are crucial to strengthening the walkable, bikeable urban areas that we want for our residents. 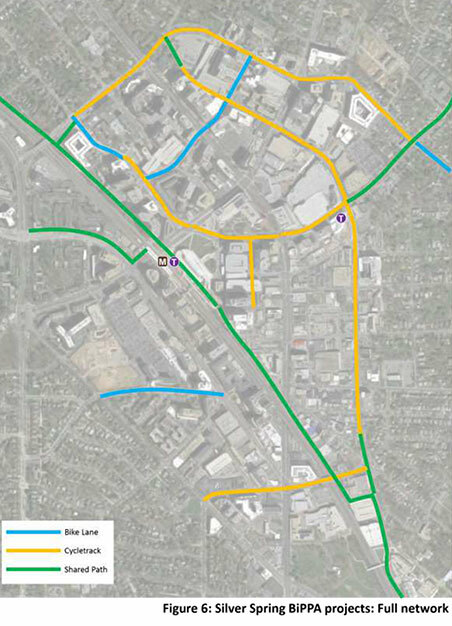 The full Silver Spring network would include protected bike lanes on Spring St., Wayne Ave, Fenton St., Dixon Ave, Burlington Ave, and portions of Second Ave., shared-use paths (Metropolitan Branch Trail and the Silver Spring Green Trail), and conventional bike lanes on Blair Mill Rd., Cameron St and portions of Second Ave. As a pilot project, the Network should also include at least one protected intersection. DOT estimates that building this network out by FY20 would require additional yearly funding in the BiPPA program. A budget of $2.5 million total per year will enable for build out of the Silver Spring network while beginning to implement improvements in the other priority areas (Grosvenor, Glenmont, Wheaton CBD, and Randolph/Veirs Mill). Extensive community outreach would be required in order to fulfill the plan, to help better understand and mitigate potential impacts. For the details on the network, please see the attached timeline, funding schedule, and maps (pdf). Let’s build a world-class protected bike lane network in downtown Silver Spring, to demonstrate our vision for a county that supports all transportation options. Thank you for your consideration of this proposal. According to the Washington Area Bicyclist Association (WABA), Montgomery County is finally catching up – and in some ways surpassing – the District and Northern Virginia when it comes to next generation bicycle planning and infrastructure. The evidence abounds. The County constructed its first protected bike lane on Woodglen Ave (White Flint) in 2014 and is on the verge of constructing another one on Spring St. (Silver Spring) this summer. Thanks to the efforts of the Greater Olney Civic Association, Councilmember Navarro and myself, the County is strongly considering a separated bike lane on Bowie Mill Rd. in the near future. Meanwhile, the County’s planning department is diligently working on an update to the County’s Bicycle Master Plan that will incorporate a data-driven approach with the latest in industry best practices. Early work for the Bicycle Master Plan has produced separated bike lane network plans for White Flint, the Shady Grove Life Sciences Center, and Silver Spring (in progress). The progress is due, in large part, to a fundamental shift in thinking about bicycling in the County. After decades of largely leaving bicyclists to their own devices, the County has begun to intentionally reorient its planning and policy in favor of bicycle safety. Research shows that people are more likely to bicycle in lower-stress environments that provide protection from motor vehicles and separation from pedestrians. We should design biking infrastructure for the people who want to bike, but do not because they do not feel safe doing so—by providing safe, low-stress connections between the County’s activity centers, transit hubs, and neighborhoods. If we can reach this group of people, the use of biking as a mode of transportation will climb considerably. This shift in policy did not happen by accident, but rather is a result of a concerted effort by bicycle advocates, planners, engineers, and County officials. Events like the First and Second Great MoCo Bicycle Summits I hosted brought together the bicycling community around the common goal of better, safer bicycle infrastructure. Indeed, the momentum created by the second summit led directly to the White Flint and Silver Spring separated bike lane networks that Planning released this fall. Get involved with the Bicycle Master Plan. You can share your insights by attending meetings and/or commenting on an interactive cycle concerns map. Also be sure to sign up for email updates from the team. Help us secure more funding for bicycle safety infrastructure. The County’s capital budget process is just around the corner, and there are number of bicycle projects in the budget, including the Bicycle Pedestrian Priority Areas (BiPPA), that we need to fully fund. You can write to the County Executive (ocemail@montgomerycountymd.gov) and the County Council (county.council@montgomerycountymd.gov) to let them know you support safe bicycle infrastructure in the County. Plan on attending the Third Annual Great MoCo Bicycle Summit, which will be held early this Summer (exact date tbd). As always, we will have a group bike ride, refreshments, top-notch presentations, and most importantly, a great gathering of bicycle enthusiasts. The Great MoCo Bike Summit was a tremendous success this year, and I want to thank each and every person who participated. We had over 100 attendees, multiple speakers, the biggest map of MoCo every created, and a plethora of great conversations. Most importantly, we created a lot of positive momentum to make significant improvements to the County’s bicycle network. County officials, advocates, and average rider are coalescing behind the central theme of the summit: we must build bicycle infrastructure (separated/protected bike lanes, secure bicyle parking at Metro, and improving connectivity between destination points, to name a few) for those that want to bike, but don’t—because they don’t feel safe doing so. This is a fundamental change to the way that County plans for and builds bicycle facilities, and a welcome change it is! So, what’s next? How can you help continue the momentum? First, I encourage you to visit the Summit’s updated web page to get a full recap of the summit. We have a video, photos, an interactive GIS feedback map, and all of the presentations posted there. Awesome Video Recap of Bike Summit! Second, as we heard about at the Summit, the Planning Department will shortly be launching into the update of the County’s Bicycle Master Plan. In addition to a host of cutting-edge analytics and data tools, the ultimate success of the Plan will hinge on feedback from people like you. I encourage you participate in that process. Visit their website to stay up-to-date! Third, Montgomery County is lucky to have a robust bicycling advocacy community. Groups like the Washington Area Bicyclist Association (WABA) and Montgomery Bicycle Advocates (MoBike) serve the County very well, and I encourage you to get involved with them. Fourth and finally, please reach out to me with any concerns, ideas, or questions you might have by emailing Councilmember.Riemer@montgomerycountymd.gov or calling 240.777.7964. The County Council has a large role to play in overseeing the Department of Transportation and funding bicycle infrastructure projects. Together, we can make a difference.